A couple was suffocated to death, while their four children, including one girl, and another couple were taken ill when a gas leaking from some industrial units engulfed some houses in a labourers’ colony at Dhandari Kalan early this morning. The building branch officials of the Municipal Corporation today demolished part of Sutlej Tower, a commercial complex on Cemetery Road in the posh shopping area of Civil Lines here, for non-payment of composition fee against violation of building bylaws. The retaining of the minimum support price (MSP) of paddy by the Union Government has invited strong criticism from many quarters. Even agricultural experts who are usually against the rise in MSP as it affects cultivation patterns and discourages diversification are supporting the cause of the farmers this time. While the Dasehra mela at the Daresi grounds is already underway and preparations are on in other parts of the city for holding such melas, the residents of Jamalpur have decided to oppose the mela to be held in their locality. A delegation, comprising residents of HIG, MIG and HL colonies, called upon the Additional Deputy Commissioner yesterday with a formal complaint asking for non-granting of official permission for the mela. 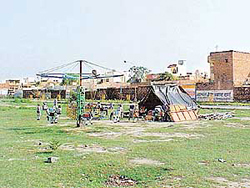 A view of the site of the proposed Dasehra mela in Jamalpur which residents have decided to oppose this time. The district administration has directed commission agents Arhtiyas of all markets in the district to maintain a record of paddy purchased below the minimum support price (MSP) fixed by the government and mention the reason for purchasing the paddy below the MSP. 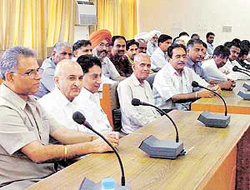 Commission agents being briefed by district administration officials on issues relating to the procurement of paddy in Ludhiana on Friday. Bharat Sanchar Nigam Limited (BSNL) will launch its mobile phone service by the end of October. This was stated by Mr G.S. Julka, General Manager, Telecom, while inaugurating the 23rd online cash counter in the telephone exchange building in Bhai Randhir Singh Nagar, here today. The Khanna police has solved the murder mystery of Yadvinder Singh of Sohian village, whose body was recovered from the fields at Ladda village on August 19. The Payal police had registered an FIR on the statement of a younger brother of the deceased. So far the police has arrested all four murder accused and recovered weapons from them. The Lotus Group of Industries on Wednesday organised a seminar to create awareness among the general public about business policies in New Zealand. The participants were acquainted with business opportunities available in New Zealand and formalities required to be completed. On the opening day of the three-day annual festival of Arya Samaj, around 300 students took part in the painting contest that was held at the local Baba Isher Singh Public School here this morning. Talent Hunt-2002 organised for postgraduate students of English, Commerce and Punjabi of G.G.N. Khalsa College evoked a lot of interest and response among students. Mr Jaswant Singh Gill, Principal, Guru Nanak College, Doraha, inaugurated the function. The campus of the Punjab College of Technical Education has been a hubbub of activities since morning. Although, various contests, which were scheduled to be held at 9 a.m., had been delayed, yet the cheerfulness of the participants was infectious. 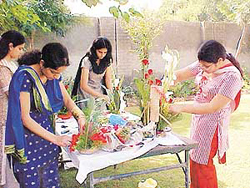 Participants at a flower arrangement competition at PCTE Campus for the function Koshish-2002. — Photo by Inderjit Verma. 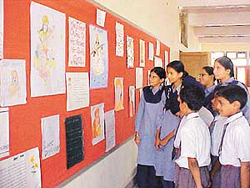 An exhibition of paintings, essays on the life and teachings of Swami Dayanand Ji was organised at Baba Isher Singh (Nanaksar) Senior Secondary School this morning. Students of middle and high school had prepared around 300 paintings. Participants in the ongoing Inter-Zonal Schools Cricket Tournament (u-14) being held here at Sacred Heart Convent School, Bhai Randhir Singh Nagar ground have alleged biased umpiring.